I have to say that after doing this for a while, I have found myself noticing things that I’ve probably seen a million times but have never really “seen.” This next find is one of those things. I had just picked up some new markers for Andrew in the school supply aisle of our grocery store when I saw these garage sale stickers. I was not planning a garage sale, however I did like all of the stickers with the different money amounts on them. They would be perfect for counting coins! I placed the stickers on some calendar cutouts (Post-It Notes, index cards or any paper works, I just like how the cutouts make it so easy to be thematic.) and got to work on the rest of the activity. Since Easter is just around the corner, I paired the sticker-ed cutouts with some plastic Easter eggs to not only make it more colorful and fun, but also help him build fine motor skills (by pulling the parts of the egg apart to open it). 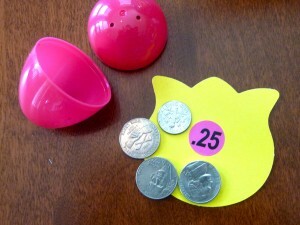 I grabbed a coin jar and filled some eggs with coins that added up to 25 cents, 50 cents, 75 cents and $1.00. 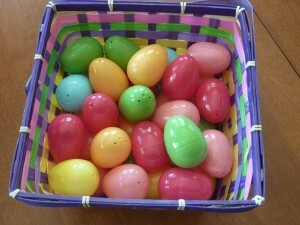 I chose to do 6 eggs and mixed them in with empty eggs to make it more of a game. 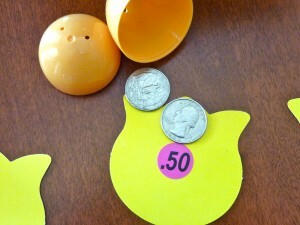 This egg has two quarters which add up to 50 cents. 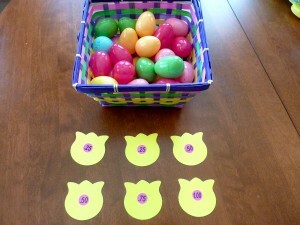 My Obstacle Course Station Activity: Hunt for the eggs with coins. Add the coins and match them with a flower that has the same amount. 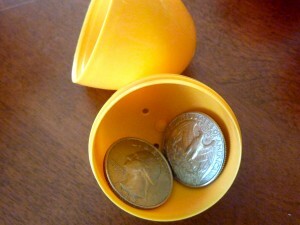 At the station, he has to find the eggs that had coins in them, open it, pour out the coins and we count them together. 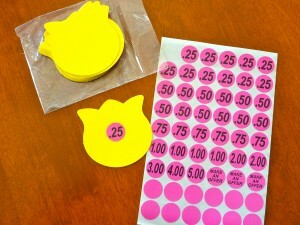 When we figure out the amount, we match up the egg and coins with a cutout that has the same amount. One dime and 3 nickels add up to 25 cents. Two quarters add up to 50 cents.